Peredovik Black Oil Sunflower Seed – food for the birds! Today I planted my Peredovik Black Oil Sunflower Seed from Russia. They are the black oil sunflower seeds that the birds love to eat and this is the variety that is in your bird seed mix that you buy in the store. They are particularly good because they are high in natural fat giving the birds energy. 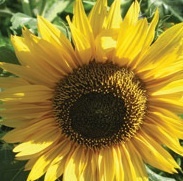 This makes them the best choice of sunflower for feeding birds although the birds love all varieties of sunflower seeds. I got mine for 2016 from Southern Seed Exchange and can’t wait for them to come up. 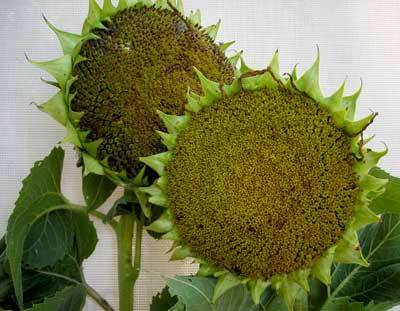 Just plant like any other sunflower seed mixed in your garden with other flowers. They have multiple heads on each stalk. They won’t be as tall as some of the giant sunflowers usually reaching 4-5 feet tall but it’s nice to know I’m helping the birds. After they flower, I leave the heads on and it’s fun to watch the birds eat them right off the plant in the fall. I leave them well into winter where the wild birds will continue to get the seeds out of the heads. This year I haven’t posted much about my giant pumpkins but I do have some growing. My biggest is named ‘Orange Crush’ because it’s coloring is more orange than any other that I’ve grown before (most have been salmon colored). 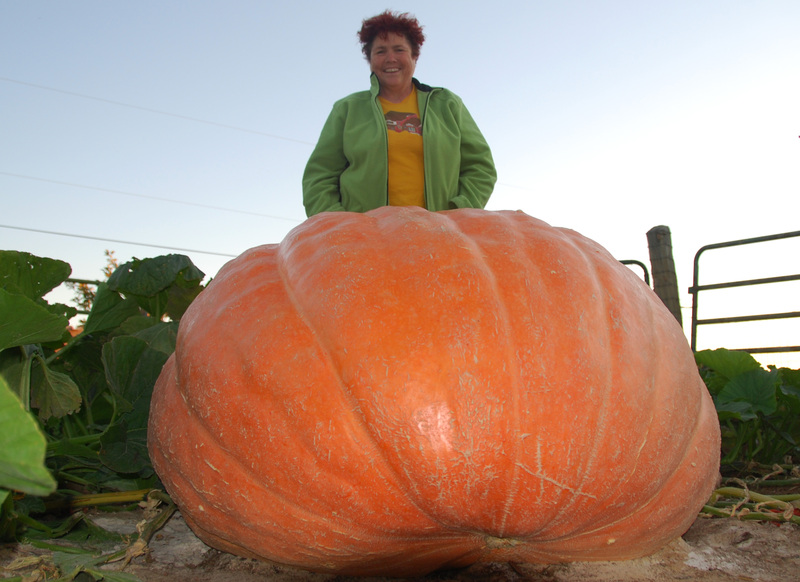 It is also the bumpiest one I’ve ever grown-not the prettiest-but pretty doesn’t count in giant pumpkin contests-weight does. Gnarly dude! It’s weight measured approximately 289 lbs yesterday and averaging 8.6 lbs a day and should hit 300 lbs tomorrow. It’s seed came from the NM state winner that I grew last year. It is behind last year’s record setter but ahead of the previous year’s winner I grew, so I don’t know what to make of it. Will it get bigger than last year or not? Only time will tell. Still have this month and a week of October for it to grow. A lot will depend on the weather-if it gets cold all of them will slow down to a crawl but if it stays warm and doesn’t freeze at night, it has a chance. My second biggest is ‘Hugo’ which is flat and oval shaped and on a different plant. Rather beautiful, smooth skinned but doesn’t weigh as much coming in at 182 lbs averaging 5 lbs a day so far. I will leave it to see how big it will get. I also have three smaller ones-2 on one plant and one on a fourth. I weighed them all and decided to take one that weighed 153 lbs (shown above-I love the glow) and another one that was 100 lbs to the State fair today. 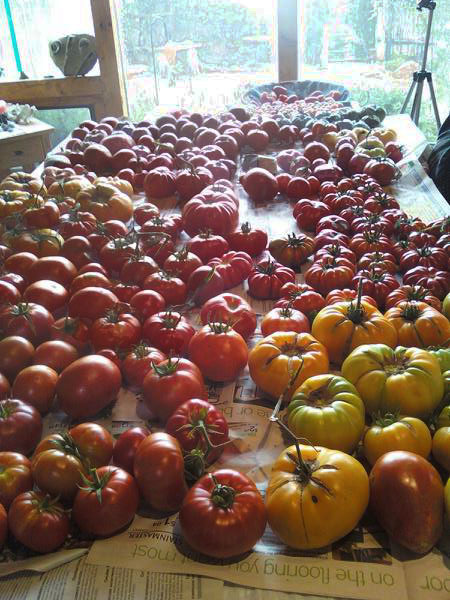 I cull some of them to take to the fair but of course leave the biggest ones to keep growing for the contest in Colorado. I also took my two biggest zucchini (so far) to the fair as they don’t give ribbons for them at the national contests. One was 38.5 lbs and the other was 33 lbs. Last year’s record I set came in at 62 lbs. at the Colorado weigh off. I still have more zucchini growing that I hope will get bigger than last year. Max and Kryptonite are done. Gone. Cut up and given away for food. A good ending to a great story. The giant pumpkin season is now done. In fact all the vegetables are done. Well almost. Gardening is never really over. Now it’s time to get ready for the next gardening season or you can wait for spring. Either way, you should clean up your vegetable garden of all the plants that have by now frozen and died and dispose of them with the garbage collectors or in a landfill. Why take them to a land fill and not compost them? Most of us don’t really compost hot enough to kill all the disease pathogens especially going into winter. I do compost the actual fruit or vegetables just not the plants. Powdery mildew, early blight and other diseases can be spread to next year’s crops- so bag the plants and dispose of them in a landfill. They’ll still break down, just not in YOUR garden. Yes folks it’s true, Mad Max will get axed tomorrow morning at the 4th Annual Pumpkin Bash here in front of Liquid Light Glass’s studio at 10AM. 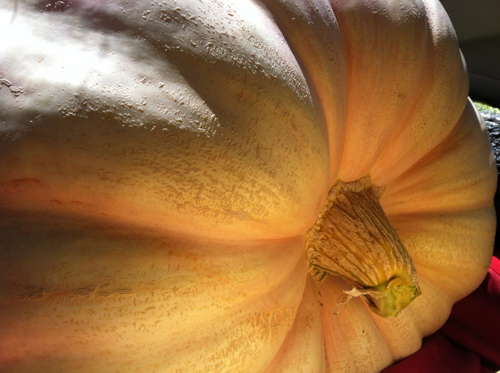 We are looking to give away mass quantities of fresh organically grown giant pumpkin tomorrow by noon. 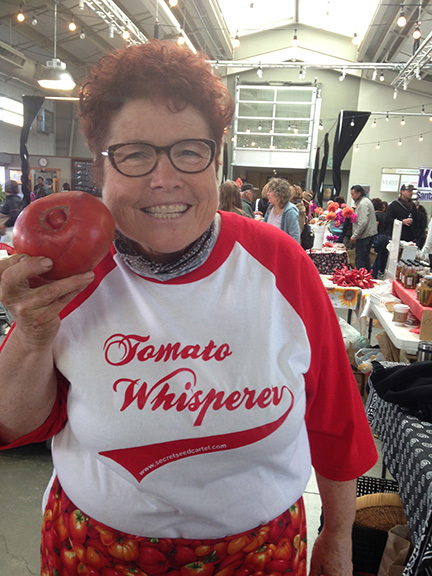 And if anyone sez they don’t taste good, then either they weren’t grown organically or they’ve never tasted one cause they are delicious. Better come early cause last year it was gone in one hour! Any Leftovers will be donated to Kitchen Angels or any charitable organizations that feed the hungry. Some people have asked me if it’s hard to see my giant pumpkins get cut up and the answer is yes. I have to work through the thought of cutting them up but then I tell myself it’s better than rotting in some compost pile-which isn’t bad either as it goes back to feed the earth. But they have a higher purpose-feeding people. Besides I need the seeds! 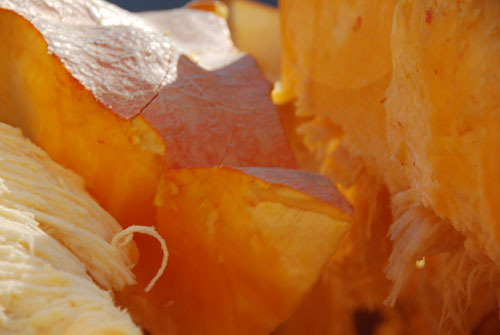 Cut, quarter and clean out your squash of seeds and stringy stuff. Put oil on exposed edges and put face down on foil lined cookie sheet in a little water and place foil on top of squash so it doesn’t dry out. Cook at 350 degrees for 30 min-1 hr or until soft when pierced by fork. Scoop out flesh and place in a big soup pot and add 8-10 cups of either water, OR chicken broth OR vegetable broth-your preference. Then take a mixer or one of those hand held blender wands and mix till smooth. Heat and then add the can of coconut milk, some fresh grated ginger (peel first) and honey to taste. Do not boil. Yummy! Here are some pics of the weigh-off on last Saturday in Colorado Springs. It’s always fun to see everyone’s results after growing these giants for 6 months or more. I planted all my giant veggie seeds on April 7 of this year-that was 188 days of the plants growing. No wonder we become attached! And the actual pumpkins/squashes were pollinated around July 10, which was 95 days for my pumpkin/squash to grow. That’s 448 lbs of growth in 95 days! 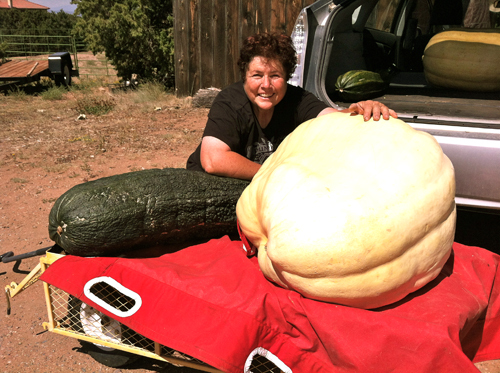 Most growers get around 120 days to grow these behemoths but here in Santa Fe we have a much shorter growing season as most of you know plus we’ve been in drought this year and on a good year we don’t get much rain compared to say Ohio or New York or just about anywhere else! Mad Max and me looking like a mad hatter with that hair! Last day before cutoff. Many of you asked how to I load these giant vegetables. Here are some pictures of the guys loading the giant pumpkins into the truck. If the pumpkins get much bigger, I’ll have to get them in with a hoist. Many thanks to Janet and Tom Hiron for loaning me their truck, Pepe, for hauling these behemoths up to the weigh-off in Colorado and to the ‘Mad Max’ guys who loaded them. It truly takes a village to get help grow and promote these giants! Tomorrow I will post pics of the weigh-off.